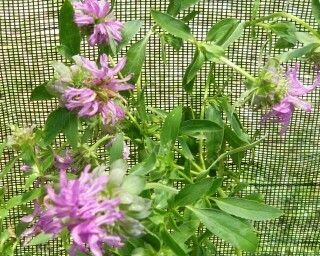 Lemon Bergamot (bee balm) - Southwestern native plant. Young shoots and leaves have a strong lemon scent and flavor and are traditionally used to flavor wild game. Also used in herbal teas. Pretty purple-pink flowers when in in bloom attract beneficial insects, bees to the garden. Self-seeding Annual. Live starter plant in 3 inch container.